Dangun Feveron is available starting on 4/4/2018! Are you ready to boogie? The website has also been updated with lots of new content. The English site is officially open! Stay tuned for more details. Important notice about flashing lights in the original game. 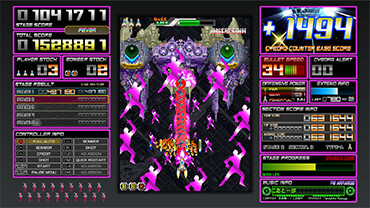 In the arcade version, when firing a Bomber or when a boss changes color, the effects flashed very brightly and intensely. We have tried to leave these effects as close as possible to the original version while keeping health concerns in mind. Thanks for your understanding for these changes. © 1998 CAVE Interactive CO.,LTD. © 2017 M2 Co., Ltd. Distributed by M2 Co., Ltd. under license from CAVE Interactive CO., LTD.
"Xbox One" is a trademark of Microsoft Corporation.